Shares of U.S. Steel have been trading in a narrow pattern since a nasty post earnings breakdown back on August 2nd. The stock dropped over 10% that day on very heavy trade, its third 10% plus decline this year. Shares continued to drift lower in early August ;https://twitter.com/GarySMorrow/status/1027217957015969792 ,and by mid month X was retesting a key support zone. The stock has been tracing out a very solid base since. Heading into this week the $29.00 area has held 6 of the last 7 weekly lows. As this week comes to an end X is trading at new September highs. The six week basing pattern is beginning to look quite solid. The stock has a few more challenges, namely a declining 50 day moving average, but we believe the stock is setting up well for a healthy pre-earnings(Oct. 31)run. 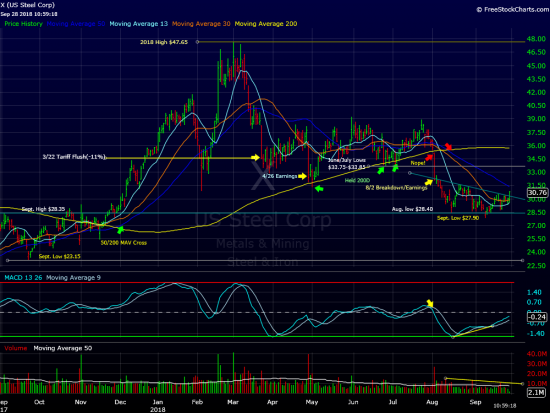 At current levels we regard US Steel as a fairly low risk buy. A close back below $28.80 would violate this week’s low sending a clear warning sign that more basing is ahead. At time of publication we are long X in some managed accounts.